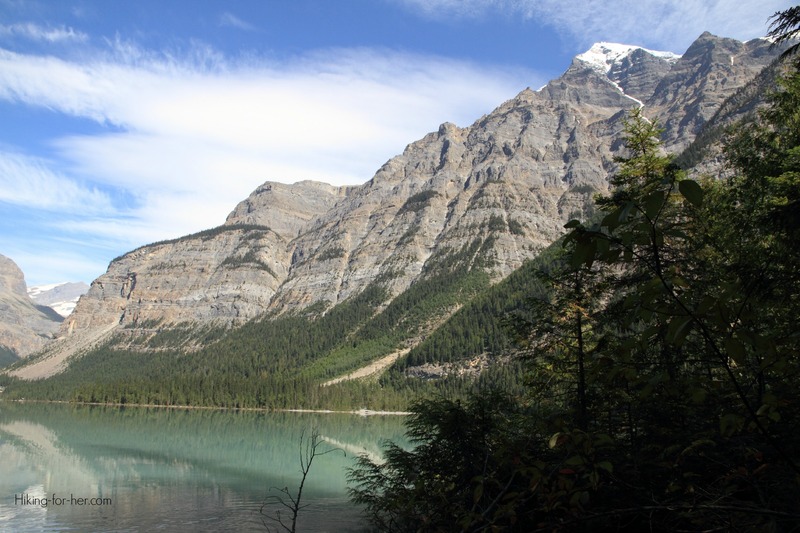 The importance of healthy hiking: what a vast topic! Healthy means you're able to meet the challenges and demands of life. Hiker health means you are able to tackle a trail, AND are eager to do so! And you're reaping the multiple health benefits of hiking. The benefits of hiking - be prepared to be amazed at how many of them there are. Not every hiking resource will tell you this, but it's not all a bed of roses on the hiking trail. As a hiker, you will go through phases of being rock solid (no aches, pains or injuries). And you will also be challenged by physical or mental issues that keep your trail time from being completely satisfying. In the worst case scenario, healthy hiking has been replaced by no hiking at all as you deal with injury rehabilitation. Luckily, you've stumbled upon a treasure trove of healthy hiking tips. This page will help you navigate to the topics of interest. Because inevitably you'll be moving between camps as a hiker: the healthy, and the striving to be healthy, hiker. Which of these two camps are you in right now? 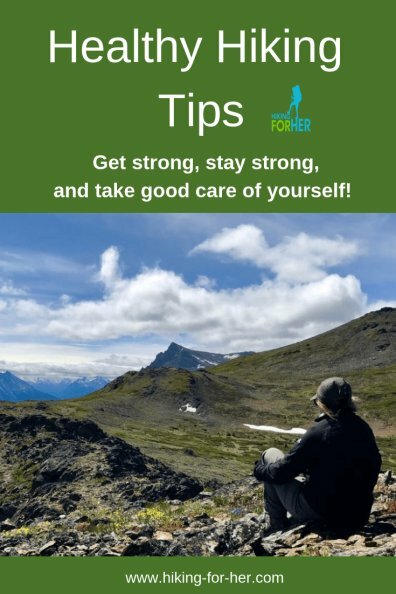 Hiker health maintenance: you're on the prowl for some great hiking tips to keep yourself hiking for many years to come. Hiker health issues: you're dealing with problems that are keeping you from hiking as much as you'd like. Let's get started with an unusual, but important, hiker health question. Do you approach healthy hiking from all four perspectives? physical (last, but not least). Are you surprised to hear that what you do in your daily life impacts your trail time? It does! Here are all of the details about how to stay healthy as a hiker, from four different perspectives. And here are some product recommendations, sourced from a store called Pharmaca. On any hiking trail, you put your joints and skeletal muscles through a work out, and inevitably there will be some inflammation, soreness and pain. This doesn't necessarily lead to injury, but taking good care of yourself is a great injury prevention hiking habit. If you're not stretching before and after a hike, please consider stretches as an important prevention strategy. Too late for prevention, as in OUCH?!! Or is it your digestive system providing a little feedback, possibly about contaminated drinking water? For even more hiking self care tips, read this. It's possible that you are getting post-hike clues that your body is not happy with what's on your feet and your back. Commit your time and money to the best hiking gear for your style of hiking. 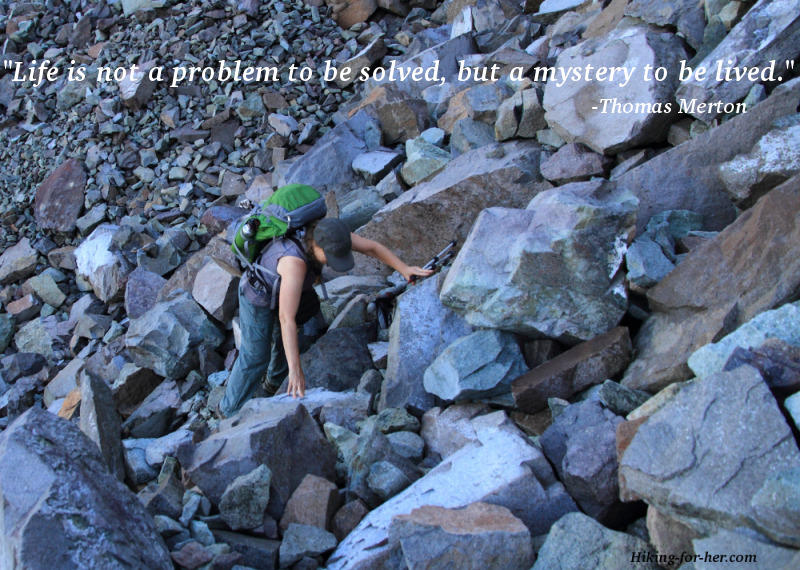 Sad to say, but the reality is that trial and error is what it takes to get the best hiking gear for your hiking style. If you are on a two or three hour day hike, you don't need to pay attention to carrying food with you, except for the wisdom of the Ten Essentials (includes "carry extra food at all times"). Everyone else on a hiking trail? Your hiking food matters! A lot! Get started exploring the wonderful world of tasty, nutritious hiking food here. The fact that you're eager to go into areas that are not conquered or civilized (the mountains, the woods, and anywhere in between) means that you trust yourself and your hiking companions. And that you've discovered that hiking heals. If you want to explore the idea of solo hiking and the fears it may bring up, read this. Although now you know how to solve a few hiking problems! People of all ages hit the trail, and hopefully you will continue to hike into your golden years. But we all face specific challenges at various times. A woman's life cycle brings new and different challenges, both on and off the trail! Recognize yourself in any of these questions? Are you stressed out in what is often called the prime of your life? Completely in over your head with work, significant other, school, and other relentless responsibilities? Spending time in Nature is good medicine. Are you raising the next generation of hikers, and want to teach them tricks and tips for strong hiking bodies? Or are you past the child rearing years, and as an older hiker, interested in some tips to keep you on the trail for many more seasons? Regardless of your age, hiking makes you happier along with the obvious cardiovascular and strength benefits. Just getting started as a healthy hiker? Pay close attention to hiking foot care. Try new nutritious hiking foods on your next adventure. Give your taste buds AND your feet something new to explore! Pay attention to your hygiene. Keep a trail journal or hiking log, noting what makes you feel fantastic. Also keep track of which types of trails challenge you, and which of the 4 perspectives (see above) are involved. What will you do with that information? Switch up your hiking pace so your heart rate is variable and your exertion level is appropriate to the terrain. This reaps huge health benefits as a hiker that spill over into your off trail life. Don't think that you'll get your gear and clothing combinations right on the first try. It will take lots of mileage before you sort out what works for you, and what doesn't. Develop healthy hiking habits like these, and you'll be in great shape to tackle any trail. Regardless of your motivation for seeking information about hiking health, you've come to the right place. As a hiker with 5+ decades of trail time, I've been through a lot of physical and mental challenges. In fact, I've had to give up my hiking plans at times in order to deal with them and heal them. I've rebounded from pulled muscles, inflamed tendons, back soreness, and chronic neck pain related to hiking. I have a background in human biology, with textbook knowledge & research experience as a university professor, so I know the jargon and follow the research findings. I have years of practical experience working with the human body as a musculoskeletal health practitioner, including medical massage and naprapathic practices. My about page gives more details. And let's not forget my motivation for this website: as a weekly hiker, I'm highly motivated to figure out what's going on with my own body when I get signs of inflammation, muscle strains, or just new aches & pains. Because I can't help myself! The way I see it, once you've lived on the planet at least 60 years, it's time to give back to the human hiking community. Which explains why I wrote this book of best dayhiking tips which can be used by anyone interested in getting the most out of hiking (yes, even the guys or those who don't identify with either gender). I'm not a medical doctor, so don't expect medical advice about medications or treatments. Instead, expect an empathetic ear and some trail tested strategies and tips to try. Oh, and one more thing: I like to hear from other hikers willing to share their unique insights into healthy hiking. If we all pool our resources, we not only tempt people to get off the couch, out the door and onto the trail, but keep them there with great big smiles! And we keep ourselves happy and healthy on the hiking trail of life. 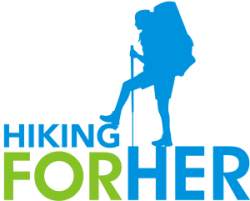 So if you have some tips for healthier hiking, send them to me via this CONTACT link. It makes all of us better, healthier hikers. Have you signed up yet for the free monthly newsletter filled with healthy hiking tips?